The Salesforce JDBC Driver is a powerful tool that allows you to easily connect-to live Salesforce & Force.com data through any JDBC capable application or tool! 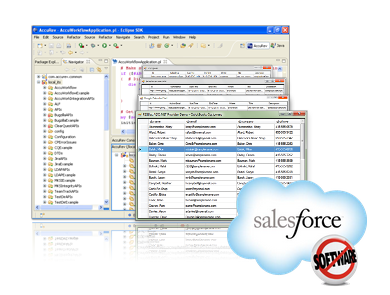 With the Driver users can access Salesforce & Force.com the same way that they would connect to any other JDBC data source. The Drivers are completely self-contained; no additional software installation is required. The Salesforce JDBC Driver offers the most natural way to access Salesforce data from any Java/J2EE application. Simply use the Salesforce Driver to connect and access data just as you would access any traditional database. The drivers is completely self-contained - no additional software installation is required! Access Salesforce data through widely available tools. The JDBC interface offers the greatest accessibility to Salesforce data from Java based applications and developer technologies. The Salesforce Driver has the same JDBC architecture as the JDBC drivers for MySQL and OLEDB, including Connection, Statement and ResultSet objects. Because of this you can now access Salesforce data in an easy, familiar way. You can use the Salesforce Driver through popular IDEs (Eclipse, IntelliJ, NetBeans, etc. ), in code through familiar classes, and in data controls available through Swing, Eclipse SWT Widgets, etc.